We serve the Houston community and beyond by spreading the love of Jesus Christ with faith, hope, and enthusiasm! Did you know--in our great big, state of Texas, 1 in 4 children is food insecure and may not know where his/her next meal is coming from? 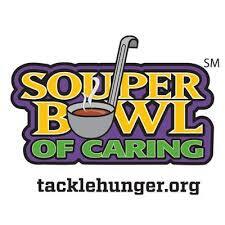 MDLC will respond by again participating in the Souper Bowl of Caring this year. We will take up a noisy offering on Super Bowl Sunday, Feb. 3, and collect personal care items starting this Sunday. You can also participate in the Souper Bowl of Caring as individual. You can donate when you grocery shop at Albertsons, Central Market, H-E-B, Kroger, Market Street, Tom Thumb, Randalls, and Mi Tienda. Look for the SBoC display and buy pre-packaged groceries or make a cash donation at the register. In addition Luby's will give 5 percent of the proceeds from any soup sales from Jan. 14-Feb. 3 to support the Souper Bowl of Caring. Do you feel connected to God when you pray? Sometimes we find ourselves in ruts--always eating the same meals, doing the same activities. It's helpful to refresh all areas of our lives, including our prayer life. Here are some ideas: try a different prayer posture, pray with a Gospel reading or one (or several) of the Psalms. Envision a conversation with Jesus. Say the Jesus prayer: "Lord Jesus Christ, Son of God, have mercy on me, a sinner." May we all find peace, comfort, hope and joy through our time spent in prayer. Do you have ideas for enhancing our prayer life, connectedness, and care for others? Please email karenwhitefield@me.com or call (713) 446-8678. Sign Up for "News from the Pews"
To sign up for our weekly e-newsletter, click HERE! Memorial Drive Lutheran Church is a member of the Evangelical Lutheran Church of America and the Texas-Louisiana Gulf Coast Synod. E-mail admin@mdlc.org with any questions or comments.